WHAT HAPPENED: Syracuse was held without a field goal from the 11:45 mark until just over four minutes left in the first half. In that time, Clemson turned a slim 13-8 lead into a 27-11 margin. A 10-1 run to start the second half would pull the Orange to within 45-32 with 10:16 left. But the deficit just proved too much for Syracuse, and they could never cut the lead to below double digits in its first ACC loss of the season. 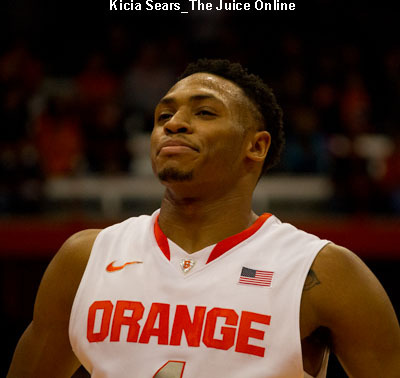 » Related: Is Syracuse basketball’s recent win streak real or a mirage? 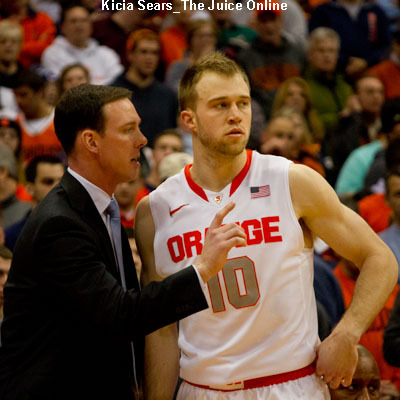 ANALYSIS: Syracuse played one of its worst all-around games of the season. On offense, the Orange shot 36 percent from the field and an ice-cold 2-14 from downtown. The ball movement simply wasn’t there, as the Orange assisted on just seven of 20 baskets. On defense, SU allowed the 282nd ranked offense in the country to shoot 45 percent from the field and 8-20 from downtown. Clemson also dominated SU on the glass 40-30, and collected 13 offensive rebounds. The 2-3 zone was mostly ineffective, with only 10 turnovers and zero blocks. HERO: Clemson got offense from freshman Donte Grantham, an unlikely source. He came in shooting just 21-82 (25 percent) from beyond the arc, but was 4-8 from downtown for a team-high 16 points. Rod Hall chipped in 15 points and six assists on the offensive end, but his defense was much more valuable (more on that below). 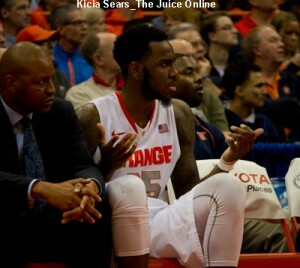 If it wasn’t for Rakeem Christmas, things would’ve been much worse for Syracuse. He scored the team’s first nine points, and ended with 21 points and 10 rebounds. ZERO: SU’s top gun from downtown, Trevor Cooney, was completely blanketed by Hall all night, and was 0-7 from the field and 0-5 from downtown. SU’s third leading scorer, Michael Gbinije, wasn’t much better. He was 4-12 from the field for 11 points, most of them coming when Clemson already had taken a commanding lead. WHAT’S NEXT: Syracuse returns home to play Boston College on Tuesday, Jan. 20 at 7 p.m. TV: ESPNU.